House training a Yorkie can be a challenge, but one well worth the effort. 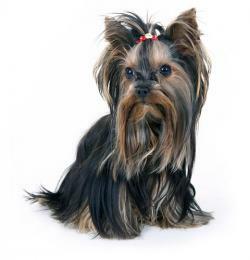 Share one Yorkshire Terrier owner's difficulty in fully housebreaking his dog. Should he stick with newspaper training, or should he begin retraining his pet from scratch? I have a Yorkie that's going to be two years old in July. Since we live in an apartment, I trained him to pee on newspapers. He'll usually use the papers if I have him confined, but he'll pee on my bed and other areas if I don't. This situation is frustrating because I can't seem to teach him not to do this. What can I do about correcting the problem and is it possible for me to retrain him to pee outside? This gorgeous little breed is notoriously difficult to housebreak, but it can be done. It does take time and diligence. Here are my recommendations. The papers are only useful when your dog is confined, so let's get rid of them and start from scratch. You need to treat your dog like a new puppy and take him outside frequently, beginning first thing in the morning. Choose a one word command, such as "potty," and repeat it patiently until he goes, then praise him saying "good potty." This associates the word with the deed and the praise. Now we need to address issues inside of the house. I'm going to recommend that you restrict your dog's access to your bedroom. Part of the reason he is peeing on your bed is that your scent is there, so he's marking to claim you as part of his territory. Keep the door closed and lower the level of temptation. Since he's probably sprinkling in other areas, I think you might give a canine belly band a try. This product works just like a diaper or child's training pants. Your dog wears it around the house, and it only comes off when it's time to potty outside. When he wets indoors, he'll experience the sensation of being wet, something most dogs don't like. Let him deal with it for just a few minutes, then remove the belly band, and wipe him off. Take him outside and give him a chance to do things right. Remember to use your command and praise any success. This isn't going to be a quick and easy training because Terriers have a strong urge to mark their territory. However, if you're determined, I believe you can do it.